I have taken an incredibly long break from posting here over the last several years. My complete focus was on my teenagers as I followed them and guided them through their busy high school years. Now that I am about to be an empty nester, I thought it might be a good time to start my blog again. 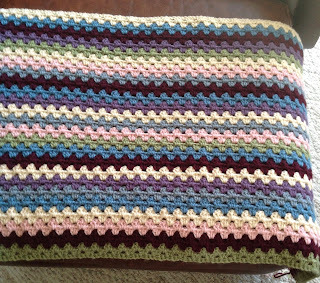 As you can see, the older border emphasized the pink in the blanket too much when my original intent was to bring out the warmer tones and let the brighter squares pop here and there. The new border achieves this effect a lot better, is wider like Lucy's original version, and coordinates a lot better with my home's decor. I was so happy with the experience of making it and with the end product that I definitely see a lot more stash busting in my future (More on that in an upcoming post). I hope to match her blanket-making prowess. I am well on my way with the one I have recently made and several that I made in past years but never documented with photos, unfortunately. Happy blanket-making everyone. It has been a busy Fall without a lot of quality time for knitting, crochet or any other fiber pursuits. However, in anticipation for the very cold temperatures I knew would be coming my way (it is currently two degrees outside), I decided to make a cowl. It took me awhile to finish, but here it is. I made it with Debbie Bliss Cashmerino Aran wool that I found on sale at my LYS. The yarn feels wonderful up against my skin, so I can wear it with anything. 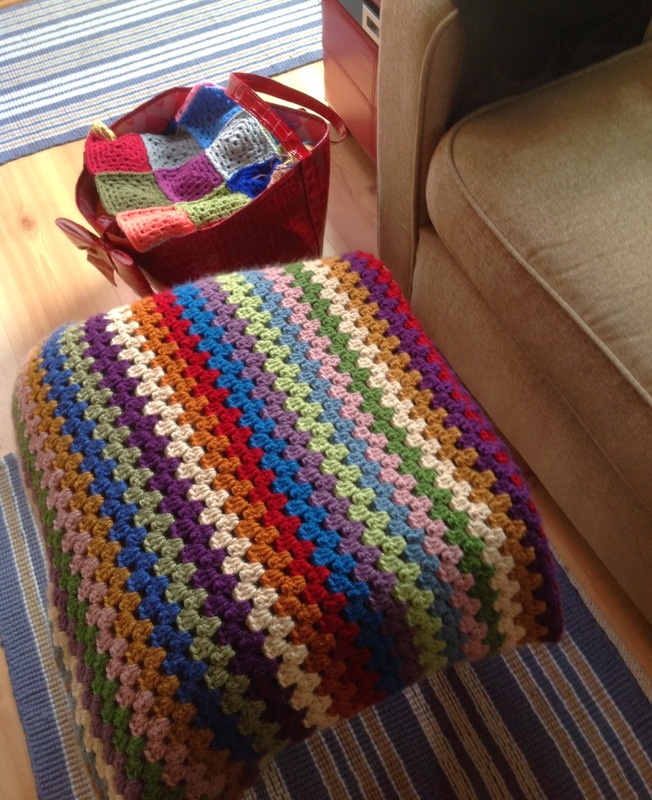 The pattern I used can be found on Ravelry for free. 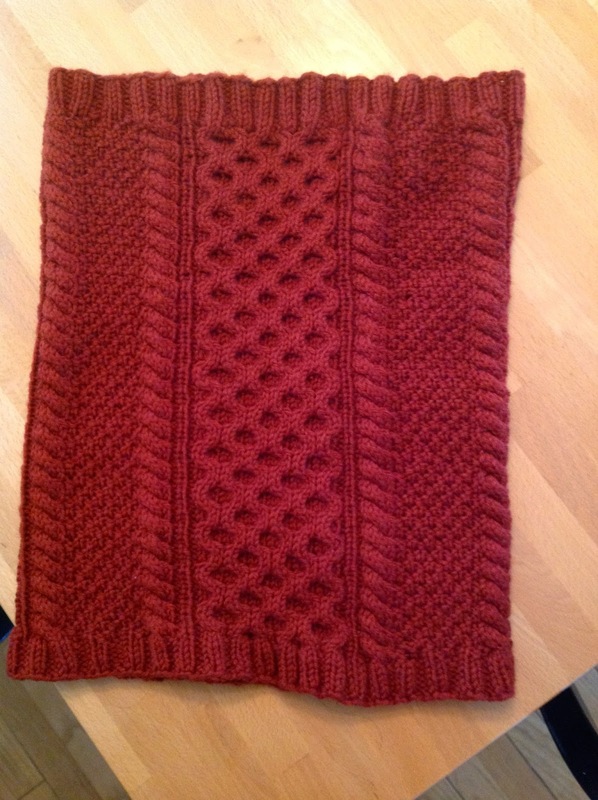 Check out this link on Ravelry for information: Suzknittyspinner - Honeycomb Cowl. I have always been a fan of blocking knitted items even though it takes time at the end when you just can't wait to wear the item or to give it to someone special. However, wet blocking an item in no rinse wool wash (I use Eucalan for moth prevention), especially when it is made of wool, can do wonders for it. In the past, I always finished the entire piece before blocking it, but lately, I have been tempted to block it in pieces as I see many knitters do. There are advantages to each method. 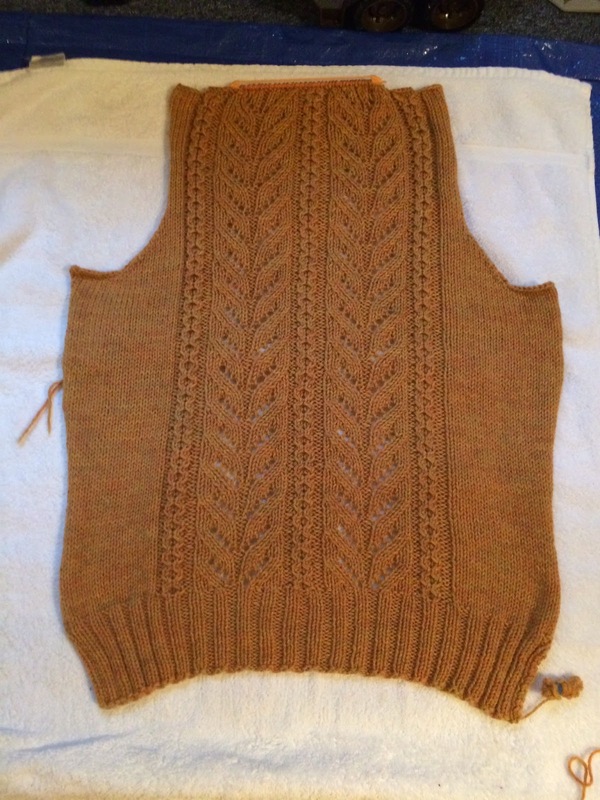 When you block the whole sweater at once, you are completely finished with it once it is dry. If it is a cardigan, you have already picked up and knit the button band since all of the pieces were already seamed before blocking. This means you only have to wet the item once. The down side is that when seaming the pieces, they can sometimes be a bit tricky to work with since they are still curled up more than they would be after blocking. This is where seaming in pieces can really be great and it is why I decided to do it this time. 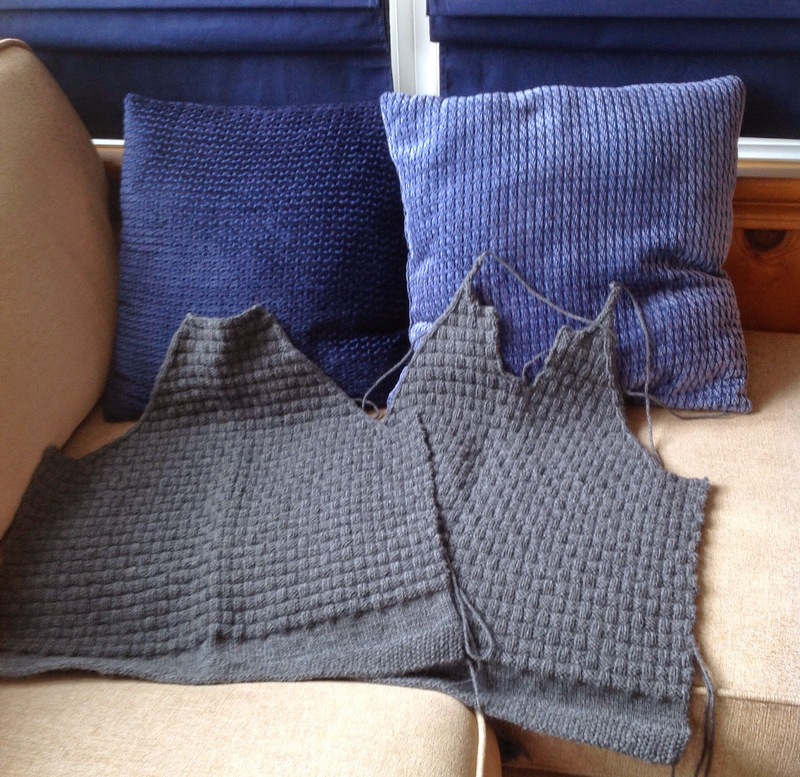 Once the pieces are blocked, seaming it is so much easier! The edges of the pieces are almost flat and the stitch definition is sharp, so it is a lot more clear which stitch to use for mattress stitch as you work up the sides of each piece. As you can see, I lay out a large lawn tarp on the basement floor and cover it with towels. I then lay out each of the pieces, measuring them as I lay them out to be sure they meet the desired dimensions. I don't usually pin sweater pieces, but the two fronts of this cardigan appeared unusually small to me. I wanted to be sure they reached the dimensions, so I pinned them in a few key spots to be sure they stretched out a bit. I put on a fan and let these pieces dry for over day. I was so happy with the results. Each of the pieces seems to be exactly the widths I desired. Unfortunately, the lengths are slightly longer than I had planned, but not too much so that it will be a problem. I am not sure why this happened since I was extremely careful during the blocking process not to let the wool pieces hand down as I picked them up and moved them around. My only theory is that it has something to do with the lace pattern. I will admit that I didn't pay as much attention to my row gauge as I should have. 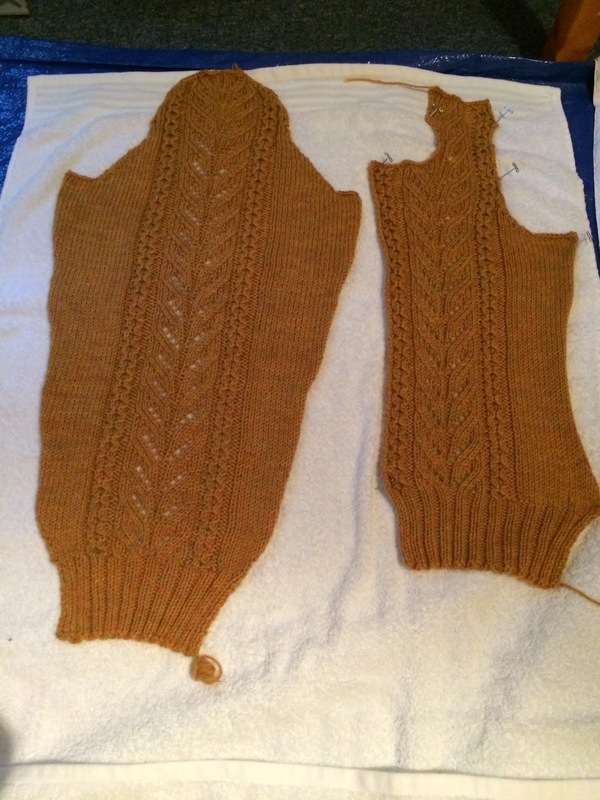 I am working on seaming the pieces now and hoping to have an FO soon. If anyone is still following my blog, I am sure you have been wondering if I had given up for good. Sorry it has been so long. Not only has this summer been very busy with my kids' activities and my work, but I also suffered from a running injury and have been in physical therapy. Trying to recover has really been my primary focus. I am starting to see the light at the end of the tunnel, though, so here is hoping I can get back to blogging on a semi-regular basis. In the meantime, I have been able to keep up with a bit of knitting. 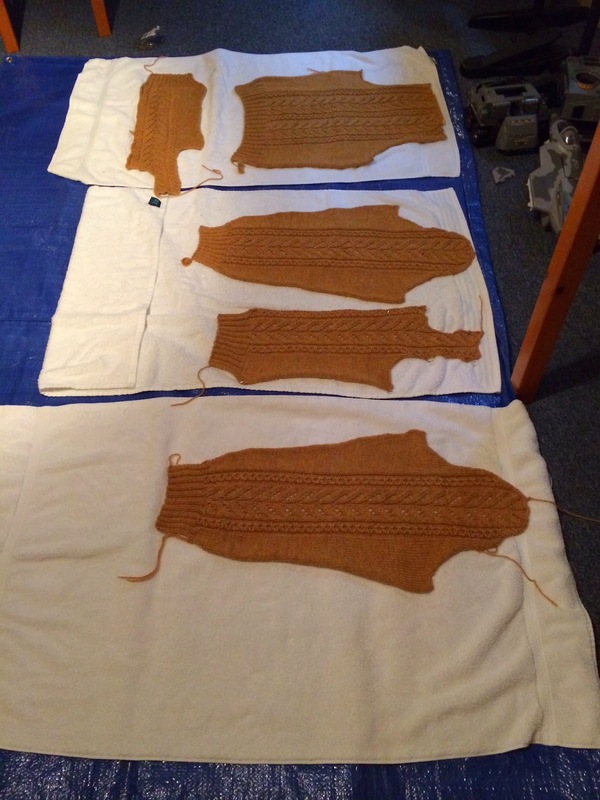 I finished all four pieces of the sweater I am designing myself (Aran and Lace Cardigan). They are waiting patiently to be blocked so that I can try to get them to meet my measurement guidelines. They appear to be a little small at the moment, but if they block in the same way the swatch did, everything should work out well. I have been a bit nervous to test out my theory, though, so they sit in the corner calling to me. Maybe once I finish up the two five-week summer classes I am teaching, I will get up the courage to bite the bullet. Below is another photo to give an idea of the size of the cowl. 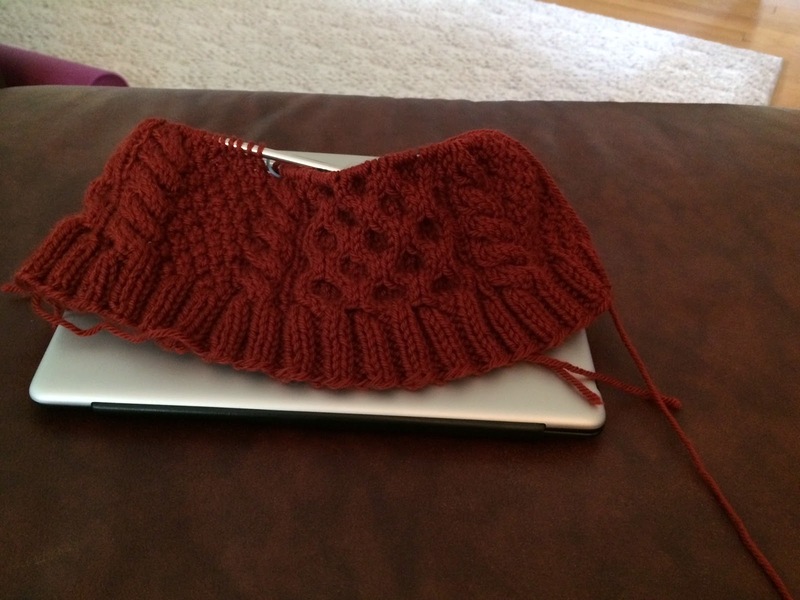 Keep in mind that I intend to use the blocking process to get it to relax quite a bit to meet the desired dimensions. I always knit the type of fabric I like and then rely on blocking to get the piece to fit in the way I like as long as the blocking doesn't distort the pattern in any way. Since this is a cowl, I have a lot more flexibility. I am really enjoying working with Debbie Bliss's Cashmerino Aran for the very first time. It has a lovely soft hand. I realize that this means it could grow and might pill considerable, but I will keep these factors in mind when blocking and when wearing it. Since it is a cowl, I am not too concerned about pilling. There doesn't seem to be too much abrasion when wearing something on your neck. However, softness was a primary consideration for me since I hate to have any scratchiness next to my neck. What has everyone else been working on this summer? I would love to hear about your projects in the comments. Sorry that I have been away for so long, but life just seems to get really busy around this time of year, doesn't it? My teaching semester ended, but that just means I am beginning a new summer session soon, which entails a lot of planning. Of course, my kids are at the end of their school year, which means a lot of events and a lot of studying for final exams. Sometimes that involves mom providing some support! The coiless safety pin marks the first make-one increase. Notice that it falls between the first stitch of the sleeve and the second. I decided to keep the first stitch in st st so that it would be eay to sew up in the end. The mint green locking stitch marker is marking the second increase. Since it falls right before the first increase, which is obviously a st st column consistently throughout the pattern, it is easy for me to look at the next instance of a st st column further along to see that I need to purl this stitch. Now for the arrows, which really illustrate the overall principle I used. The two hot pink arrows indicate the original first stitch of the pattern and the original second stitch of the pattern before I began the increases. This allows me to always refer back to the original directions and work backwards from there to determine which stitches should come in between these two. The blue arrows indicate the stitches that have been increased. There are three increases so far; the first two are marked with markers lower down in the sleeve, and the third increase had just been completed recently, so it hadn't been marked yet. I usually move the mint green marker up to the most recent increase after I have built up a couple of stitches above it but before it is time for another increase. To check to be sure I am increasing in pattern properly, I glance down the row to see what the stitches look like before the column of st st to be sure the look of my new stitches is the same. It had been much further along, but I realized after I had completed it up to about the elbow that I wasn't increasing consistently at the end of the row. Apparently, I was increasing at the beginning of the row every time I needed to do so, but I would often forget to increase at the end or that same row when needed. This would have produced an awfully lopsided sleeve! You know what that means -- rip! It seems I do a lot of ripping, but it never bothers me too much since I love to knit so much. As you can tell I am a process knitter -- the time it takes me never seems to get to me too much since I just enjoy doing it. Not very efficient, though! Lately, I have had the urge to make progress on both sweaters that I have been making since each of them was at a point where I needed to sit down and concentrate on the shaping. Kearsarge had been sitting in a corner patiently for a long time, needing some focus on the neckline shaping. I spent a bit of time with him and am pleased to now have the back and front completed. This pattern is written so that you must knit a different pattern on the sleeves than on the body. I am a bit sad to be finished with the wonderful basketweave pattern (one of my favorite to knit because it is interesting yet simple and easy to get into a flow while knitting it). 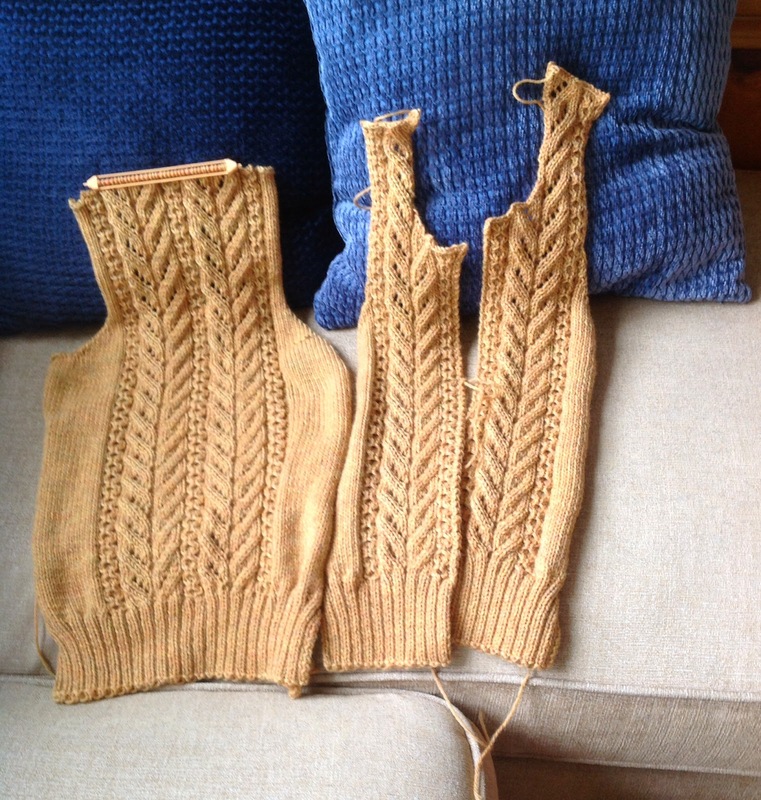 The sleeves are knitted in mistake rib patterning, so they will be great for carry-along knitting. I hope to be able to put this sweater to bed soon. The sweater that I have been designing had also gotten to the point where the second front needed some concentration while shaping the neckline. Here are the two fronts and the back completed. I am really liking the way this sweater is coming together, although, I am still a bit concerned about how narrow the two fronts look. I had this same fear when I knitted Lisa Lloyd's Ravensong, which is also a fitted sweater, but it turned out fine once blocked. I just keep telling myself to trust my blocked swatch since it shows how much the lace opens up, and it has the measurements upon which I am basing this design. Now, I am going to move on to making my calculations for the sleeves. You can try the sweater on as you go along if you knit it from the top down. The knitting is continuous, so it is easy to get into a great flow. 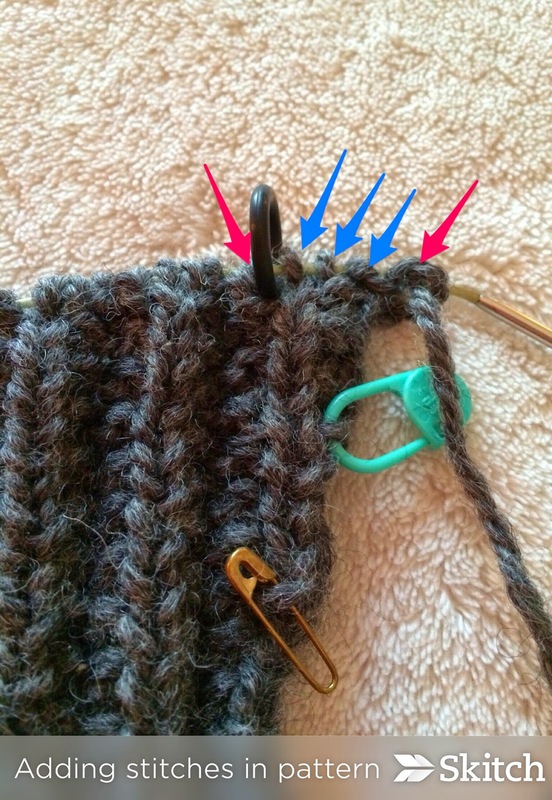 Once the knitting is finished, you only have to sew in the ends -- no seaming! 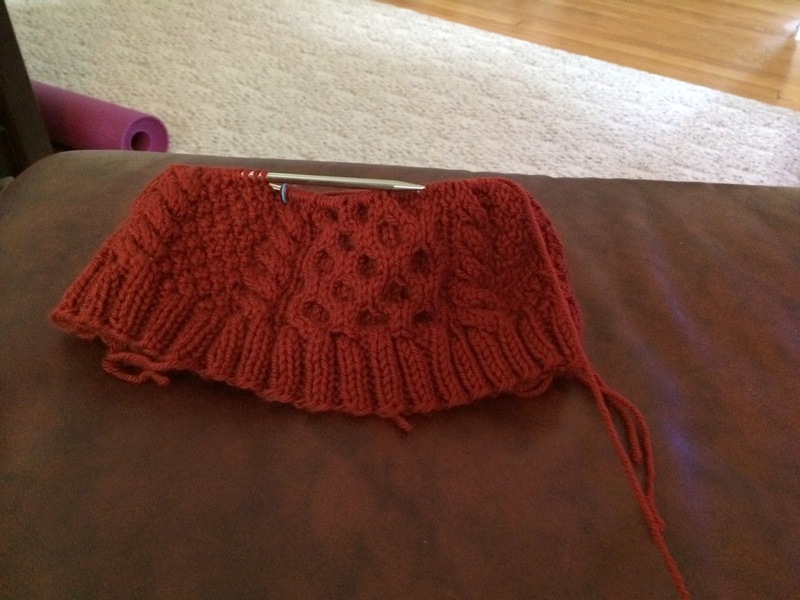 For all of the above reasons, I usually knit a simple pullover in the round from the top down. One major disadvantage that I find with knitting something as large as an adult sweater in the round is that it gets heavy and cumbersome the bigger it gets. 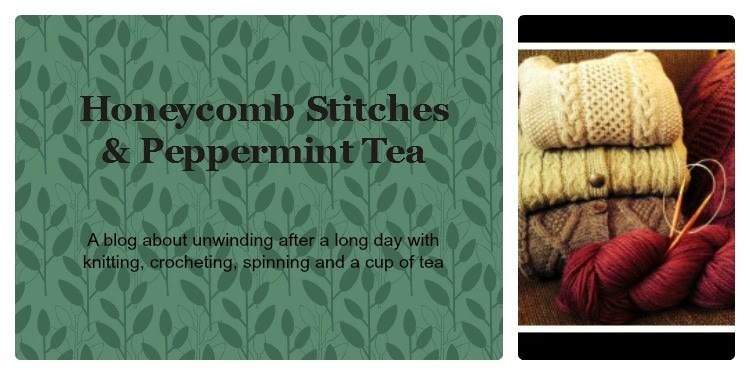 It also become difficult to carry around in a purse for knitting on the go. 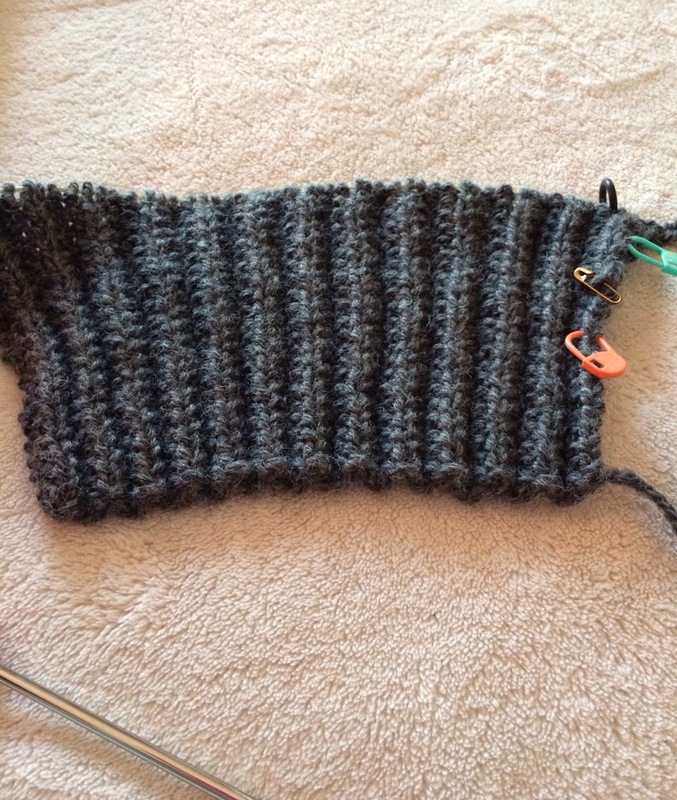 Lastly, it sometimes feels as if the knitting goes on forever since there aren't any clear stopping points when one moves onto to something new. The pieces are portable since they tend to be small or easy to roll up into a small piece for easy storage in a purse. Once a piece is finished, you get to move onto something "new" since you are beginning a new piece with its own cast-on, shaping, etc. This makes it seem like the knitting goes by more quickly. The seams seem to give the finished piece more stability, and they provide a great place to hide the yarn ends securely. 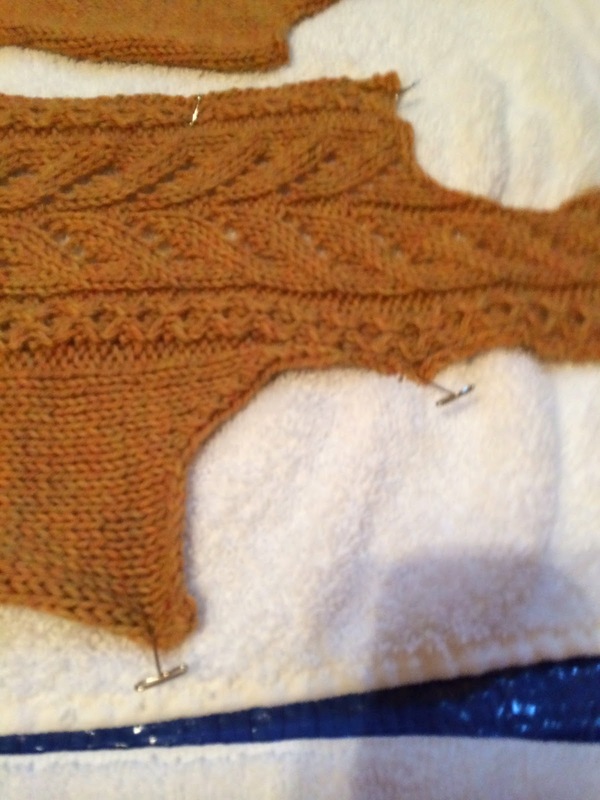 As for the seaming, it isn't my favorite part, I will admit. I like it for a brief amount of time when I first begin it, and it feels really cool to be putting together "puzzle pieces" in such an efficient manner. However, it loses its appeal fairly quickly for me, becoming something I just have to force myself to finish in several sittings. I can't do it all in one sitting since I am too slow for that, and I get back pains. However, once I reach the home stretch and finish, there is no better sense of accomplishment! I don't have a lot of new knitting/crochet to share today since I had a busy (wonderful) weekend attending my cousin's wedding. I got to knit a bit more on my cardigan, but there isn't much more to show. However, I wanted to share this picture with you just because it made me happy. I took it on a glorious Spring day last week when the sun was shining through the window for one of the first times in what seems like forever. It hit upon my crochet in a way that made me smile. Looking forward to the small patch of fabric that is now the Granny Patchwork Blanket to grow enough to join its big sis, Granny Stripes, on the couch. Hopefully that will happen in time for the cold weather when it appears again come Fall. 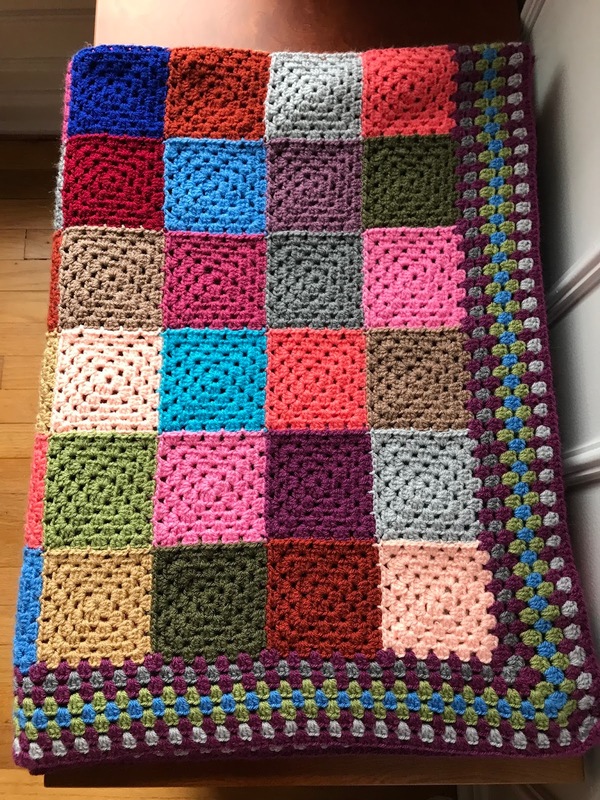 On a side note, I had a lot of fun reminiscing with my aunt about how we both learned to crochet with my Great Grandmother (her grandmother) teaching us as children. 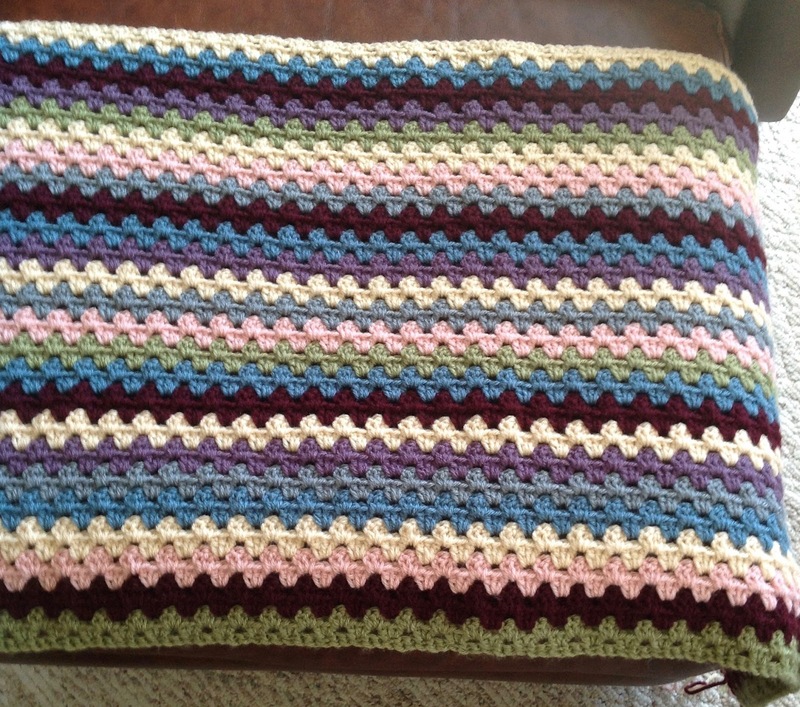 I hadn't realized that she had recently begun crocheting baby blankets again -- one for her new grandchild. It was a lot of fun learning that we shared this connection even though we live so far apart. © Suzanne Reyes. Simple theme. Powered by Blogger.